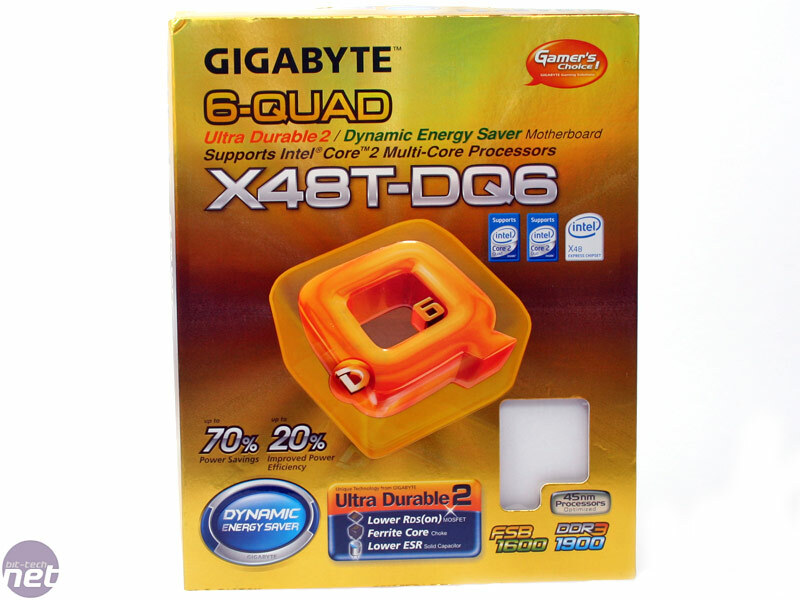 We’re quite familiar with Gigabyte’s premium DQ6 boards and the GA-X48T-DQ6 fits the bill perfectly as it features the final revision of Intel’s X48 chipset. A lot has changed since our first look at the X48 chipset – talking to Intel at CeBIT, we found out that the entire 4-series went through a respin to 65nm, and the X48 chipset has been heavily tweaked for performance and DDR3. This is part of the reason why we’re looking at the “T” version of Gigabyte’s latest flagship Intel motherboard today. Other X48 boards have been reported to unlock some core performance adjustments, most notably from the tRD chipset timing, and other more advanced BIOS options are now available. Intel is really trying to push this chipset as heavily tweakable, and while there’s no doubt that it’s expensive, it’s still cheaper than Nvidia’s nForce 790i Ultra SLI. Having said that, while the X48 can do full CrossFireX if necessary, it still lacks the industry-leading SLI standard because it’s still locked to only Nvidia chipsets. 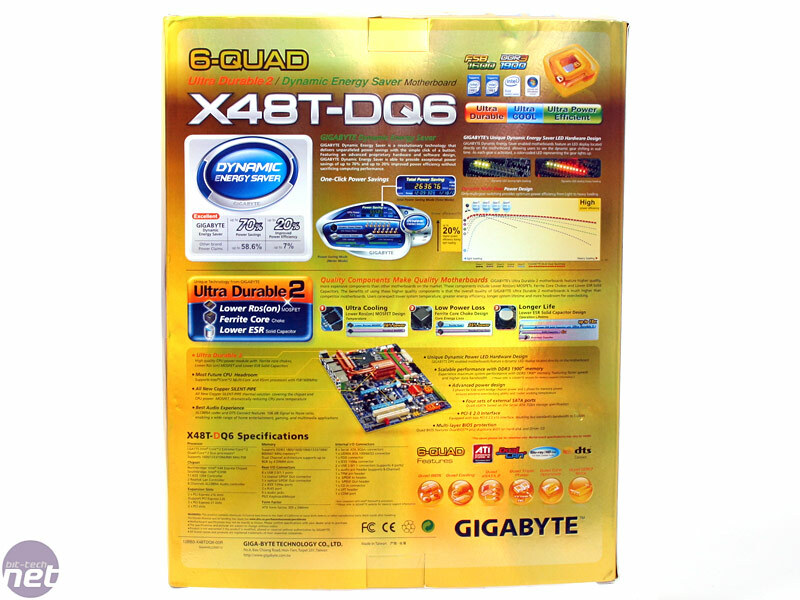 Our first look at the Gigabyte GA-X38T-DQ6 left us wanting something more – this X48T on the other hand features Gigabyte’s Dynamic Energy Saver technology and a 12-phase CPU PWM, support for DDR3 "up to 1,900MHz" and Intel’s XMP, as well as many other key features. 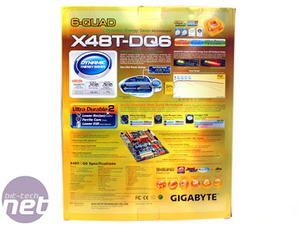 At around £176 including VAT it’s not a huge price for a premium motherboard – so is Gigabyte’s latest X48 motherboard more compelling than its X38 solutions? 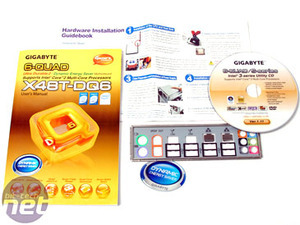 Supports socket 775 Core 2 Extreme, Quad, Duo, Pentium and Celeron processors at between 800MHz and 1,600MHz FSB. The X48T-DQ6 comes in a nice looking box, that’s for sure – it really cements the feeling like you’ve invested a considerable amount of cash wisely. In that respect, it’s also a bit strange, and almost a little bit of a letdown to get the board out the box and find it’s just “normal Gigabyte blue” though. 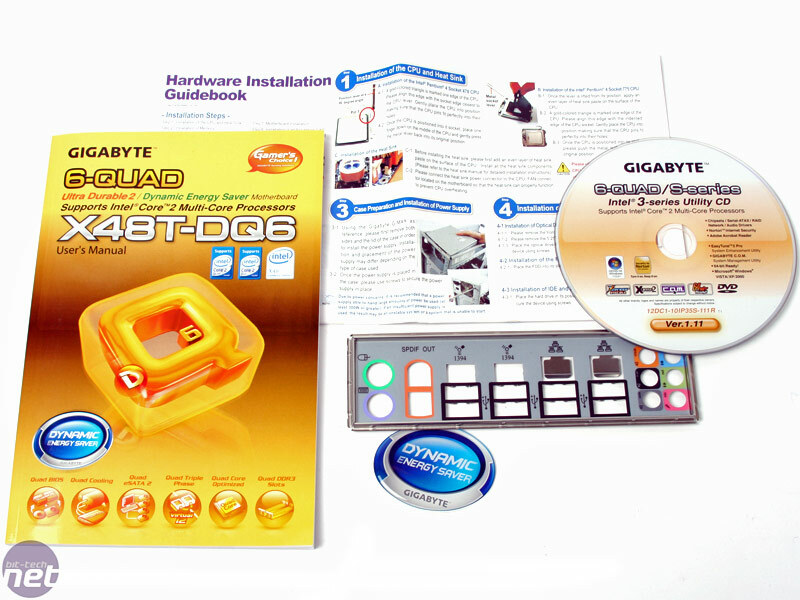 Both the manual and CD mirror the box design, but the bundle left us questioning Gigabyte’s thought process on one aspect. 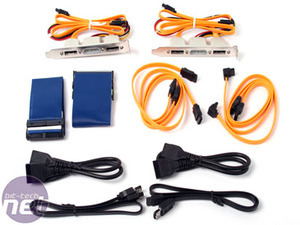 There is a good range of SATA cables—even a couple with 90 degree connectors—as well as eSATA too, but do you really need four eSATA adapters? Don’t get us wrong here, we do like the adapters as they provide the choice of internal or external ports without permanently sacrificing a connection. However, on one hand we’d suggest that two will suffice for most people (and should be replaced with two more SATA cables), but then again it’s not like SATA cables are hard to get hold of. 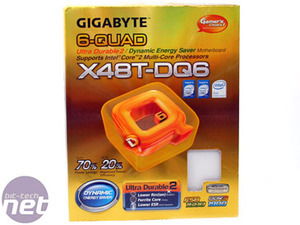 For the first time we’re without Molex to SATA power adapters too – Gigabyte understandably thinks anyone investing in a top-end board like this will at least have a recent PSU to match and we agree. Gigabyte doesn’t go down the route of including thermal probes, sticky rubber stand-offs and all sorts of other paraphernalia – it’s an essential package that is a little bit no frills, but at the same time it’s a no fuss approach.